Angela Kennedy with her artwork 'Vein'. Angela is a multi-disciplinary artist, activist and somatic dance practitioner. She said: "I am interested in how my inherently choreographic practice manifests into performance installation, poetry, movement, drawing, walking, spoken word and video. My work is about embodied processes and the body." 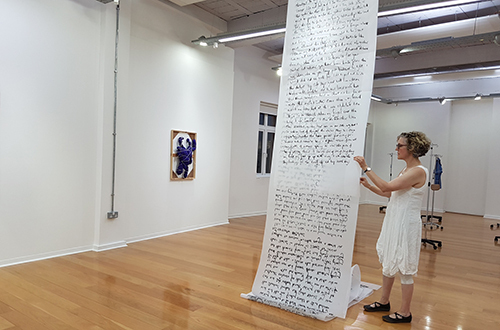 Angela’s practice of thirty years continues to explore issues of equality, feminism, identity, class and social justice; her socially engaged practice reflects on issues concerning social justice, identity and gender. She was a regular visiting lecturer for University of Sunderland from 1995 - 2016 with regard to the work of Pina Bausch and Rosemary Butcher. From 2008-10 she taught the modules 'Fundamental Movement' and' Improvisation and the Body', at Northumbria University on the Choreography degree. Since 1986 Angela has made over twenty five pieces of performance and dance theatre, she has presented two solo exhibitions of paintings. She is a freelance artist for the BALTIC Centre for Contemporary Art, works part-time as a Creative Broker for Arts and Dance Connect and has 29 years experience of working with the arts as a facilitator, socially engaged artist and lecturer in Education and Higher Education as well as with women's groups and many diverse communities. She is a founding member of Artists Union England and was an Executive Member from 2012 to June 2018.